All Hail the README File! The goal of the readme file is to keep it short and sweet. Provide just enough information to help the developer know how to work with the software project. If you are writing software that is only going to be modified in-house or as an open-source project, it makes sense to include a topic like How to get the latest version from source code control. If you are delivering a software package, it is useful to include topics like How to install and Getting Started. If you are delivering a web service API, a good topic could be How to authenticate your client. The file can be quickly created and maintained even in software shops that hold little regard for documentation or the software development process. All current and future developers will have a single source of helpful information right at their fingertips, right alongside the code. This saves a LOT of time (and we all know that time = money) and frustration. It enables one to see when a procedure is getting overly complicated and in need of refinement and simplification. It provides a talking point for discussion. How does one name a readme file? README.TXT, README, readme, readme.html, readme.txt, or _readme.txt. Depending on your operating system and the tool/command you are using to view your files, the highlighted names are typically used to cause the file to appear close to the top of the list of files. 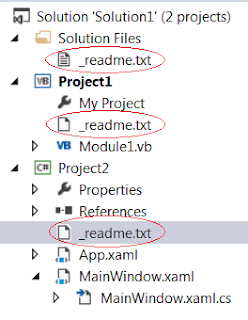 When should we create the readme file? Ideally before any code is written. This helps the author plan and think about how to structure the project(s). Why I wrote this blog post: As a software consultant, most software projects I have seen either have no readme file or one so huge it is difficult to maintain. 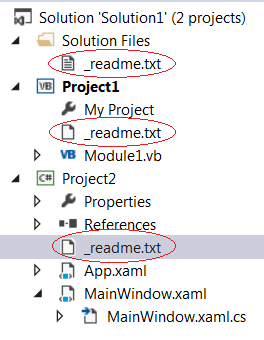 The latter point indicating the software project might possibly be overly complicated, or perhaps it is so large that each module warrants its own readme file.